Close your eyes, and keep them closed for ten seconds. Like myself, I’m sure you see fuzzy darkness, different broken up and indescribable shapes, and also a variety of changing colors. It crawls and emerges as a spider does. If you were to wake up and see a spider crawling on the wall above or next to your bed your first reaction I’m sure, like mine normally would be, is to wake up immediately frightened and kill it. Yet, when I see this tiny “spider” that is not my initial reaction, and I lay in bed completely calm for reasons I can’t even explain. One of my first recollections of this phantom spider was when I slowly opened up my eyes and groggily saw the dark shadowy object gradually make its way up my lamp shade on the nightstand next to my bed. It was small and was not scary looking by all means. As I watched it reach the top of the lamp shade I simultaneously had become more awake and alert; but the spider seemed to have disappeared out of thin air magically. In a calm state I began questioning myself if I had really just seen a spider crawl up the lamp shade, and assumed it may have just made its way onto the inside part of the shade. Or, perhaps I was just seeing things? Regardless, I didn’t get up and simply fell back to sleep – the spider got to live another day, if it was real. As time went on my little phantom friend would appear in different areas surrounding my bed. Yes – a couple of times it’s crawled right in front of my face past my pillow and disappeared behind the edge of the bed; the same small-dark-looking and harmless figure with the same precise movements as it crawled its way in front of my own eyes, still appearing as dark and blurry. Once again I was not frightened by the spider for some reason as I lay there almost half asleep, and only one time did I check to see if it were hiding behind the edge of my mattress, because I needed to know if I was going crazy or not – but it was nowhere to be seen. Sometimes since I would fall back asleep after seeing the spider, after waking up again, I would wonder if I was just dreaming all along; had I even really woke up in the first place and saw this spider or illusion? 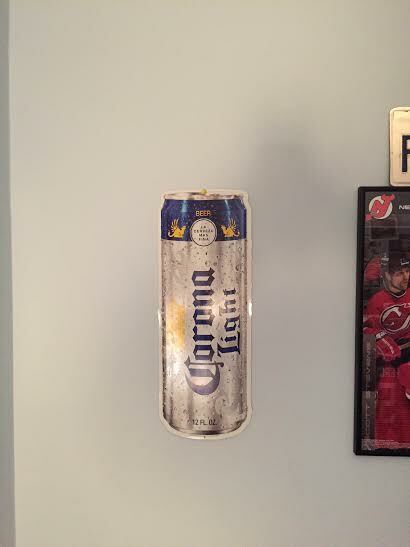 Sure, I may have dreamed about it once, but I recently confirmed I was awake this time as I saw the harmless dark shadow make its way up the wall right next to my bed, and disappear under this hung up Corona Light beer sign. I was more than wide awake this time and determined to face this sneaky phantom that seemed to be toying with my mind. I lifted up the beer sign and once again – no sign of the spider. So, I finally took the time to find out what the meaning of the “spider” is. There are a few meanings behind the spirit symbol of the spider, and most of them I can relate to. Common meanings for the spider totem are patience, creativity, weaver of life’s fate, and perspective. Symbolism of the spider: Life spirit and weaver of destiny: “When the spider shows up in your life, this spirit animal could guide you to integrate some piece of your personal “puzzle” and gain a more coherent perspective on your life. I see the connection with the spider with those three aspects through what I’ve been continuously working on – writing, self-branding, post-graduation life, and aspiring to be an author working on multiple books, yes that’s plural. The symbolism of the creativity and patience works hand-in-hand with working on becoming an entrepreneur through self-branding and writing books. This connection is also linked to the perspective guide the spider entails – to inspire me to keep going with what I’m trying to accomplish and believe in. I guess I look it at now that this phantom of mine was destined to appear in my life, as I continue and patiently create my “web” towards fate.